Carrie Fisher is no longer with us today. Our Princess. Our General. An icon of the Star Wars universe, Fisher was obviously best known for her role as Princess Leia. For many of us we grew up with her adventures in a galaxy far, far away and while she would appear in other films, it was her iconic role that put her into the hearts of many of us. In today's world of female action heroes, she was our first female action star. On screen her feisty Princess Leia could keep up with the boys named Luke, Han, and Chewie. She could be tough, persistent, and a leader for the Rebellion. She was our hero and most important our Princess. For a generation of 40 somethings and beyond we embraced her as we did the entire Star Wars saga to make it the cultural phenomenon it is today and because we did so Carrie Fisher will live on forever in the films she made and in the hearts of family, friends, and fans across the world. 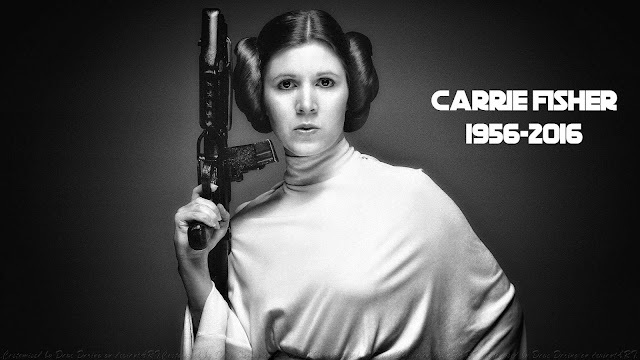 May The Force Be With You Princess. Always.